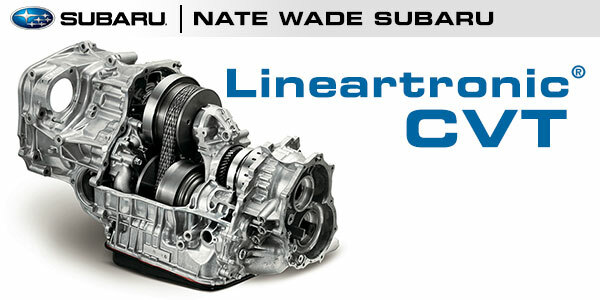 The Engineers at Subaru developed the Lineartronic® Continuously Variable Transmission to work seamlessly with the Subaru Boxer Engine and Symmetrical All Wheel Drive to produce the an extremely smooth driving experience. It also plays a major factor in making all Subaru Vehicles more efficient by reducing fuel consumption. The CVT help the Boxer Engine run at its optimal power range by providing step-less gear ratios that removes any hesitation as well as any loss of momentum while accelerating. Along with the Subaru Lineartronic CVT, the driver has the option of letting the transmission remain in automatic mode, or taking over and shifting gear ratios manually through a 6-Speed Manual Mode. While automatic mode adjusts instantly to match your desired acceleration, manual mode is controlled through the use of paddle shifters near the steering wheel, giving you the control to adjust to the gear ratio that best suits your current driving situation providing a sportier and sharper driving experience.